With Readly you can read All About History - History of Witchcraft and thousands of other magazines on your tablet and smartphone. Get access to all with just one subscription. New releases and back issues – all included. In a continent ravaged by plague, war and religious upheaval, maleficium (malicious magic) was just one more menace that people had to weather. No one was safe from maleficium, nor from accusations of practicing magic and consorting with the Devil – not even queens and courtiers. 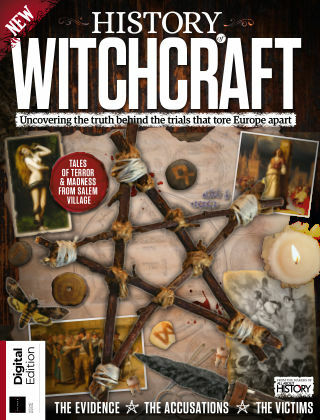 In the History of Witchcraft, we cover everything you need to know about the hunts and trials that cut a bloody swathe across Europe and the American Colonies from the Medieval times to the Early Modern age. Uncover the true stories of the panic and paranoia that swept towns up into hysteria, from accusations at Pendle Hill in Lancashire, England, to the madness of the Salem Witch Trials leading to the execution of 20 people. Find out what tools, ingredients and magical tomes real cunning folk depended on and what concoction could cure stomach ulcers. Investigate the exploits of the notorious Matthew Hopkins, the self-styled Witchfinder General who made it his mission to punish anyone whom he believed to be practising the works of the Devil. Packed with incredible illustrations and insights, this is the perfect guide for anyone who wants to learn about this dark period of history.